Once in a while, during our travels, Buddy and I encounter folks who have turned in their traditional brick-and-mortar existence for a life spent on the water. 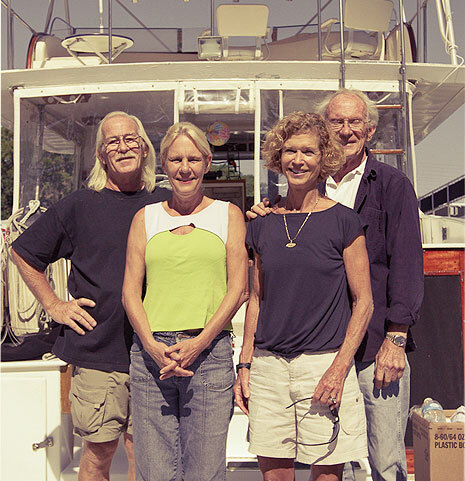 When we visited John Thompson aboard his 1964 Huckins on the St. John's River in Sanford, FL, we had the pleasure of meeting one such family. As we introduced ourselves to the Thompson's—which includes John, his wife, Joy, their three children, one cat, a turtle, a fish, a pet crab, and a bird—it was instantly apparent that they are quite at home on their yacht, both literally and figuratively. 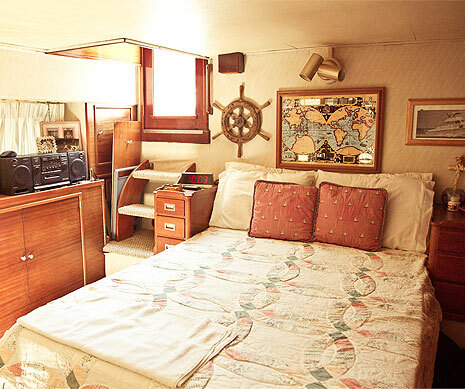 The Thompsons' home-on-the-water is named Kyma—Greek word meaning "wave"—and it seems an apropos moniker considering the sheer number of waves the boat has seen during her 48 years. We have followed her history closely and know that Kyma has been enjoyed by as many as six different owners, traveling far and wide across the open seas and along the rivers of the East Coast. Thanks to the extensive documentation and archives we keep at Huckins, we were able to gather old photographs and original drawings to share with the family. Our friendship with the boat's original owner, Calvin Houghland, allowed us to deliver yet another surprise: a magazine article detailing the boat's passage through the Panama Canal on a compelling 355-day voyage. We were not shocked to find that she was in less-than-perfect condition. Knowing the boat had seen its fair share of adventure, we were not shocked to find that she was in less-than-perfect condition. During our evaluation, we discovered chipped paint, cracks, leaks and more. We learned, however, that John is committed to making repairs to keep his boat sound and he assured us that he would work tirelessly to fix the issues we discussed. He also told us that he's not afraid to call in family reinforcements, if needed. "I try and get my son to help out with the maintenance work, especially if there's sanding to be done," he explained. "He's easily coerced if there's money to be made." When sanding, remember that most paints, primers and epoxies are toxic, so please wear a good disposable dust mask, such as 3M's 8710 Particulate Respirator, as it will provide excellent protection. Properly sanding the surface is the key to a good paint job. Make sure you apply even pressure to the sandpaper and change it regularly so that clogged paper doesn't cause unwanted scratches in the surface to be painted. As we continued our tour of the boat, Buddy pointed out the interior varnished mahogany and other original aspects of the boat. It was nice to see that the original joiner work had not been painted out or altered. 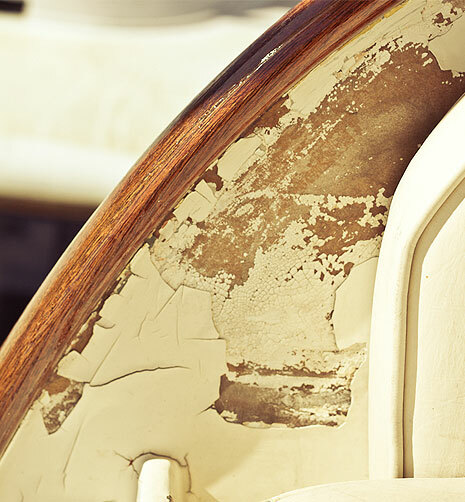 John informed us that preserving the original fit and finish was important to him, which pleased us. I couldn't help but compliment John on his commitment to upholding the Huckins standard with all of his repair work. The Thompsons could not have been more thankful for our visit, and we left knowing that we were leaving a bigger piece of the Huckins legacy behind. We made plans to return to bring supplies that would help John with his list of maintenance projects. What happened on our return visit a few months later is up next.